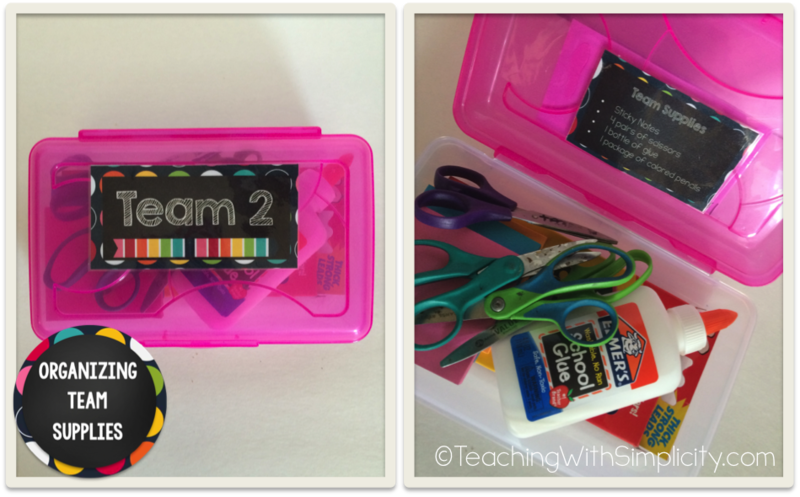 Over the years, how I organize team supplies within my classroom has evolved. All ways are functional and serve the purpose, keeping team supplies organized and available to students at all times. As of today,this is my favorite! 🙂 Currently you can find these cute plastic mason jars at Wal-Mart. The only downfall is that for a set of four the cost is $6.00. So, it could cost a chunk of change depending on the number of teams you have. I hot glued the mason jars together to create the group of four and then added ribbon. To keep the supplies in tip-top-order, each jar is labeled. Coming in at a close number two, is the divided 3 compartment plastic caddie. The Dollar Tree currently has them in a variety of colors, and they are $1.00 of course! The idea of $1.00, makes them even more appealing. 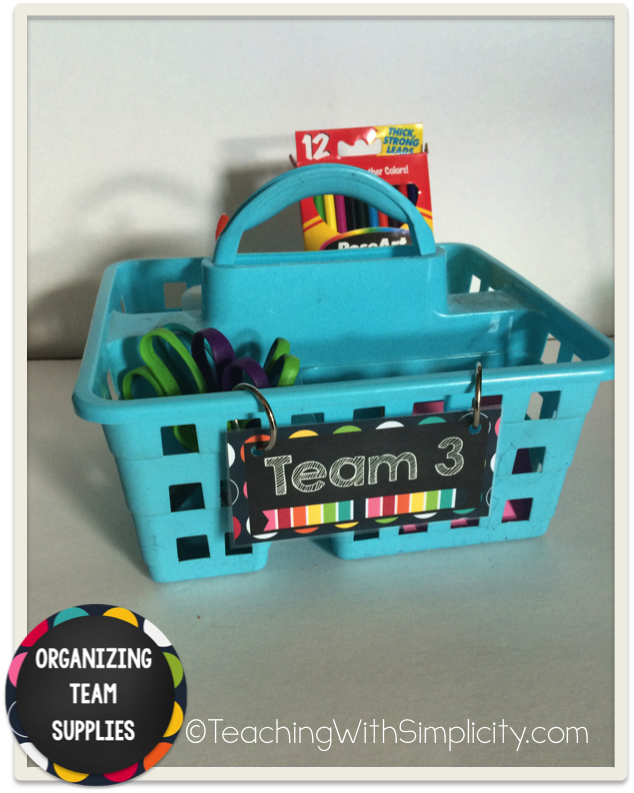 To prep this basket the only thing that needed to be done was to add the supplies, and add the team number with two 1″ loose leaf binder rings. Super simple! Last, but not least, is the art supply box. It was the first attempt at keeping team supplies organized and accessible. We are all familiar with the art supply box. They can be purchased super cheap during the back to school sales. To prep the team box, I added the team number to the top of the box. Inside the box, I added a list of the supplies that should remain in the box at all times. 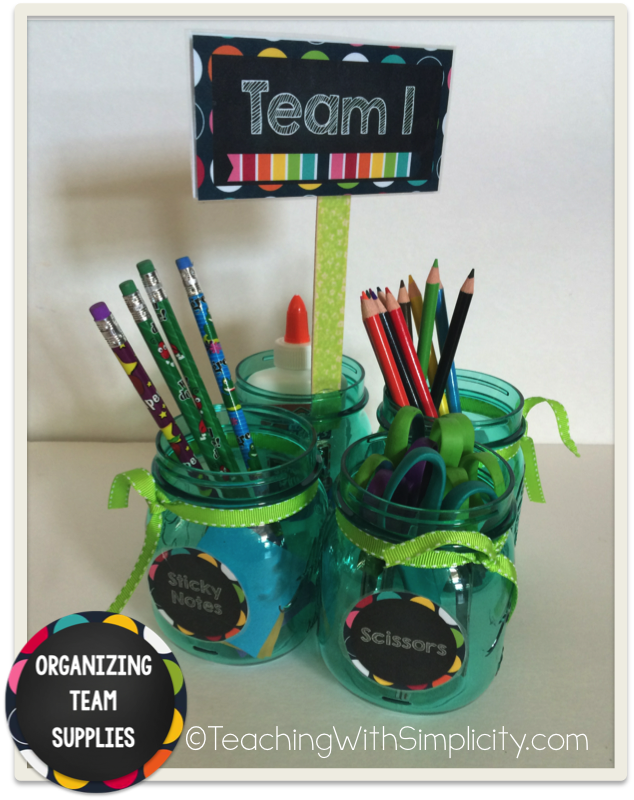 Whether you have $50 or $10 you want, or are willing, to spend on organizing team supplies, it can be done. All of the above are functional and can be spruced up to match your classroom decor! 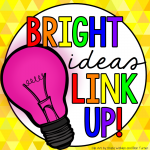 For more bright ideas from 100+ different bloggers, please browse through the link-up below and choose a topic/grade level that interests you. Thanks for visiting!